Moroccan Poufs are wonderful leather ottomans used for seating. This type of furniture can go by many names, such as hassock, tuffet , and of course ottoman. Outside the USA it's more commonly spelled "Pouffe". These lovely round ottomans have many different uses. For example it's an excellent foot stool or foot rest and a lovely piece of furniture or housewares; however it's mainly used for seating. A Moroccan Pouffe makes for an excellent piece of home decor. We hand process our Moroccan poufs by the same traditions that remain unchanged for centuries and were passed down through families for generations. We use an earth-friendly process to produce these poufs this includes using natural dyes and sunlight to tan the hides. We embroider colorful hand stitched designs onto the leather pouffe. We create new ideas to design new styles that bring trend to the world of home decor and design. 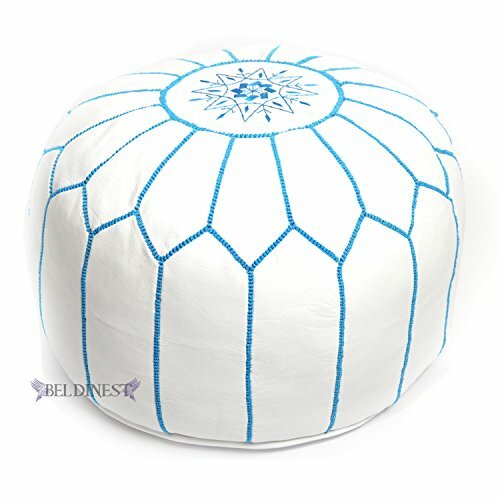 A Moroccan Pouf can come in a large variety of colors sizes and styles from simple plain designs to intricate and embroidered designs. As much as these leather poufs are useful, this type of furniture can bring a nice addition and provide seating to any room whether inside homes, restaurants, hotels, clubs, and much more, it's a beautiful piece of home decor. This hand stitched white leather pouf with Turquoise silk embroidery will make that additional impact. All our Moroccan poufs are sold stuffed. If you have any questions about this product by BeldiNest, contact us by completing and submitting the form below. If you are looking for a specif part number, please include it with your message.